Buford Betty: Woo hoo! It's a Giveaway! So this has been a good week. Scratch that. Make it a GREAT week! The hub is officially EMPLOYED!!! As in full-time, 9-5, desk with a chair, four walls, and a W-2 to boot! And big props to my husband for having the courage to make this job happen. He was initially turned down for the spot a month ago, but on a whim decided to take the guy who interviewed him out to lunch and said, "you need to hire me, fool." OK, maybe not in those words. But seriously, I'm amazed by his spirit. I SO could not do that. But wow, what a year it has been. I've stated many times that I didn't think we'd make it out of 2009 alive... the hub's last full-time pay check was deposited into our account on 9/30/2009. And here we are, right at a year later, still kickin'... and praise God, he's been blessed with a new, very exciting opportunity. These last 12 months have been a true exercise in faith, trust, and most of all... patience! God is so faithful and we are just overwhelmed with gratitude. And excitement! So now the real test begins.... over the past two years we've been "forced" to live on a very tight budget. I mean, if the money's not there, you can't spend it. Eating and paying bills were our priorities. Now with the potential of a lot more income coming in, we will have to really hunker down. Because now doing the *wise* thing will truly be a choice. Eye on the prize! And I must say, as usual, Dave Ramsey could not be coming to town at a better time. He always does that! He must be checking our schedule or something. We are volunteering at his Live event when he comes to Atlanta on October 2. And yesterday afternoon my mom and I went to his "tweet-up" and walked away with some fabulous freebies! So in honor of a fabulous new job for the hub, and Dave's arrival here in a few weeks, I'm doing a great Dave giveaway! If you're not familiar with Dave's teachings, this book is the best place to get your feet wet. The Total Money Makeover, if you work it, will change your life. Personally, our perspective on money is completely different today than it was two years ago. We've learned how to handle money the way God intended us to, and it has done wonders for our marriage and faith. The thing about the "makeover" is that it's a lifelong journey. It's not a 6-week program or something that only makes sense for a certain crowd. It's for everybody, no matter your financial situation. Whether you're living paycheck to paycheck or counting your millions in your nest egg, everyone can learn something! And what makes his advice so real and relative is the fact that he's been there. As in, 20 years ago he went bankrupt and lost everything. He then decided to figure out how money *really* works. After meeting with millionaire after millionaire, he learned the real key to building wealth is getting out of debt and staying out of debt. And the real charm of the book is his straight-forward, no-nonsense approach, topped with his uncanny humor. What's not to love? So, again, in celebration of a fantastic new job for the hub and Dave's upcoming Live event, I am giving away a SIGNED copy of Dave's NY Times best-selling book, The Total Money Makeover, along with a free 3-month subscription to his online Total Money Makeover website where you can access budgeting software, get involved with an online community of people going through the program, and much more. If you were debt-free... if you had no payments to anyone... what's one thing you'd love to do with your money? Your income is your most valuable wealth-building tool. When it doesn't have a bunch of other people's names on it, you can do some amazing things. So, what would you do? You have until Friday, September 24th at 12 midnight EST to enter! I will announce the lucky winner the following Saturday. Go get 'em! P.S. God, awesome job on answering big prayer request #1. If you answer #2 (for a baby, duh), that would be friggin' sweet. And September 2010 will officially go down in history as my favorite month EVER! To those entering, please also leave your email address if your profile or blog doesn't include any contact information. I teared a little reading this. That is just so awesome that God provided the job!!! Your husband taking the guy out to lunch, what courage!!! That is just beyond awesome!!! Congratulations to you two!!! I'll be down in ATL for the 13.1 race on 10/3. If I was debt free 1. I would invest for the future 2. I would sponsor at least one if not more children 3. I would give because now I just can't there are too many names attached to my paycheck and I hear and I want to give but I can't. First, Congrats to your husband on going after that job and getting it! Not many people would be so motivated to make something happen instead of just waiting for it. If I was debt free I would use my extra cash to travel, I'd love to be able to travel but just don't have the extra money. Thanks! Congrats on the job! If debt free I would start saving for the kids education and some for retirement. I would however go on a family trip...first part to somewhere doing stuff and then relax time like at the beach....like a 2 in one vaca....although I would want to give in some way....it is so hard to reach out and help when you feel you need to save or have the money to pay on something....would love to be able to hear a story or see someone in need and not have to worry about whether I could help but how can I help. Congratulations to both of you! You're still on my prayer list for that baby. I am also going to email you later if that's OK for some questions on your Dave Ramsey journey! Well I don't think I am allowed to win from you but I will answer it anyway. I would adopt a big bunch of cutie kiddos (or even just one bc who needs to be greedy?). And a sister for Sadie. And would save save save for the future. Actually.. I am currently debt-free but my husband and I are saving for our first home, at which point we will be in a LOT of debt. 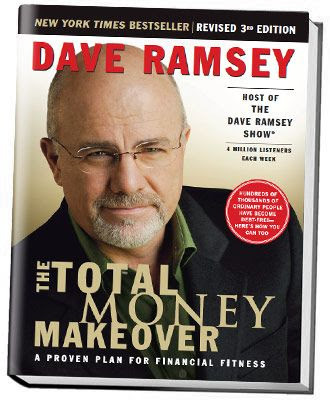 Ramsey's book definitely looks interesting - I am sure if he can be successful coming from his background that I could learn from him to put myself and my husband in an even better financial situation. Thanks for your insight! Honestly, I would like to give more of it. I feel like we get stretched thin with students loans, rent (and soon a mortgage), and a child on the way, I overlook organizations I would love to donate to because I think we can't afford it. First I would take an awesome vacation!! Then I would save money for my children's education and our future. Next I would give to our church (more than our weekly donations.) Being able to give back is such an awesome feeling and I would love to do it more than we already do financially. Congrats on the job for your sweetie. I know that is so important. What a difficult time. I know. My hubs hates his job. If we were debt free we would first take a vacation to Paris, then buy a house in my hometown so that I could see my family so much more! I would have to some to our church, since all things come from God...but, other than that - vacation! nothing better than precious time with the people you love! Would have to give some back to the church...cause all blessings come from God! other than that - vacation! Nothing better than precious memories with family! Congratulations! Hope you two are celebrating all weekend! Well, if we didn't have our mortgage payment (that's our current debt), we would probably buy a cottage "up north" where we both grew up vacationing. We'd love to have a house for our family memories that we can ensure will stay in our family for generations. We love Bay View so much and know it would provide wonderful family moments for all of us (as it already has for both B and I). Congrats on the job! I know what a load off your mind that is. Fingers crossed for prayer #2. I pitty the fool who doesn't hire your hubby! LOL. If I were debt free, I would first cry with joy and then make sure it never happened again. Oh, and then I would go on Safari to Africa with some good friends and share the experience of a lifetime.